To begin with, the Slim Folio Pro is not a “Smart Keyboard” like Apple’s Smart Keyboard Folio. What that means is that it doesn’t use Apple’s Smart Connector for power and connectivity. Instead, Logitech chose the tried-and-true technology of Bluetooth and a built-in 3-month (assuming 2 hours of typing per day) battery. Like Apple’s Smart Keyboard Folio, the Slim Folio Pro completely surrounds the iPad Pro, giving it protection while being carried. The Slim Folio Pro is actually more protective than Apple’s solution, offering corner “bumpers” to protect the iPad Pro and a slightly thicker material under the keyboard. That protection comes with a weight penalty — the 12.9-inch model adds 1.56 lb (707.43 grams) of weight to the iPad Pro, while the 11-inch model weighs 1.22 lb (552.42 grams). By comparison, the Apple Smart Keyboard Folio for 12.9-inch 3rd-generation iPad Pro ($199) weighs just 14 ounces (396.89 grams). However, there are other big differences that could tilt the decision on which keyboard folio to buy in the direction of the Logitech product. First, the keyboard provides backlighting, something the Apple keyboard folio is missing. Not everyone needs or desires a backlit keyboard, but when you do need one, it’s available with the Slim Folio Pro. The other very big difference is the addition of a row of iOS function keys to the top of the keyboard. Apple’s Smart Keyboard Folio relies on keyboard shortcuts to perform certain functions instead. The function key row on the Slim Folio Pro adds a Home key, backlight brightness up/down keys, a Spotlight search key, a key to bring up the virtual keyboard onscreen, music/video playback keys, speaker mute/volume up/volume down keys, a lock key, and Bluetooth and Battery level keys. The rest of the keyboard layout is identical to the one on the Apple Smart Keyboard Folio. The keys themselves are about the same size and have about the same level of play that the keys on the Smart Keyboard Folio have. However, the Logitech Slim Folio Pro keyboard uses “open” keys, meaning that they aren’t surrounded by fabric like the Apple keyboard keys are. That could make a difference if you want to wipe down the keyboard frequently, as water or cleaning fluids could leak into the keys on the Logitech device. Logitech uses a fabric-covered keyboard on its excellent “Keys to Go” portable keyboard, and it would have been nice to have used the same material on the Slim Folio Pro keyboard. One other feature of the Logitech Slim Folio Pro is a magnetic “flap” to keep the unit securely closed when it’s being transported. That flap also includes a storage loop for the Apple Pencil 2 that shouldn’t interfere with charging or pairing (I do not own an Apple Pencil 2, so this couldn’t be tested). Finally, Slim Folio Pro has three different configurations that it can be folded into. Most of the time it will probably be used in the typing configuration, with the screen at a 58° angle and the bottom of the iPad Pro held securely with powerful magnets. Next, the tablet can be set up so that it’s facing screen-up over the keyboard at about a 10° angle, perfect for using an Apple Pencil or other stylus for drawing. Finally, the tablet can be flipped over so that it is facing the opposite direction of the keyboard. Based on my past experience with other keyboard folios for the iPad Pro, I’m looking for two main functions when I’m using the keyboard — a good typing experience and the ability to hold the combined iPad/keyboard combo in my lap while typing. The typing “feel” is excellent, on a par with that provided by the much more expensive Apple Smart Keyboard Folio. I found that I could immediately start typing at full speed with the Logitech Slim Folio Pro, and it just “felt right”. Kudos to Logitech for their continued work on creating keyboards that are usable by professional writers! As for using the Slim Folio Pro and iPad Pro in my lap “laptop style”, the Slim Folio Pro provides a much more stable typing experience than the Apple Smart Keyboard Folio. With the latter, I’ve found that accidentally moving or bumping the screen can cause the entire assembly to “collapse”. The Slim Folio Pro is rock-solid — I can pick up the assembly and give it a really hard shake, and the screen remains in its “locked and upright position”. 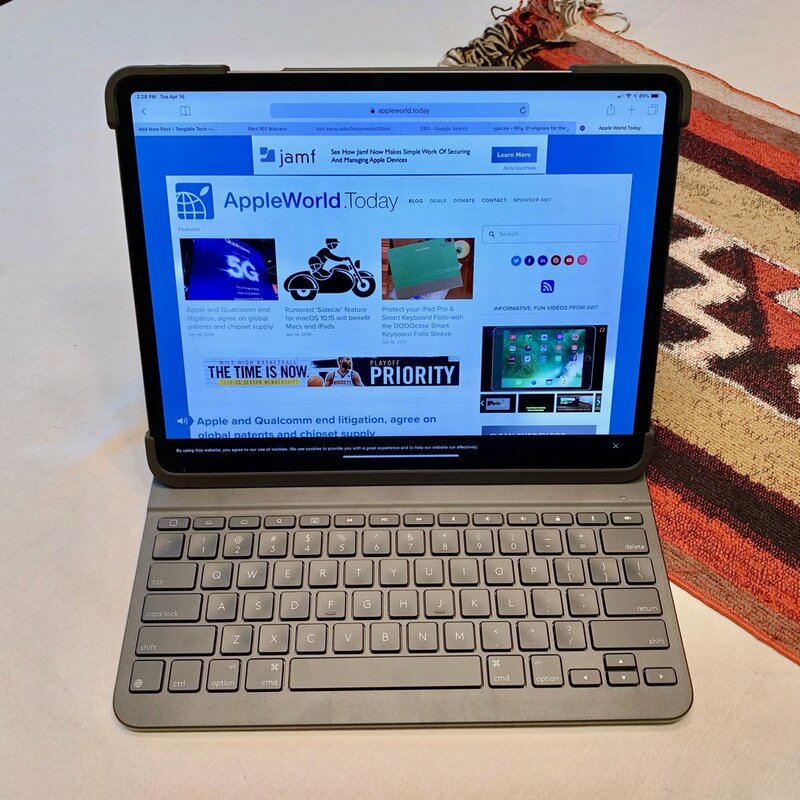 Like most iPad keyboards, the Slim Folio Pro shuts off the display when the screen is folded over the keyboard and turns it on when the screen is flipped up. Logitech smartly kept the top, bottom and right edges of the iPad Pro uncovered, so there’s nothing to get in the way of speakers and ports. The Slim Folio Pro’s extra protection extends to the power and volume buttons on the iPad Pro. They’re reached via passthroughs that provide a nice loud click sound so you know you’ve pushed ‘em. Oh, and in case you’re wondering…those same keyboard shortcuts that work on the iPad Pro and Apple’s Smart Keyboard Folio? They work on the Slim Folio Pro as well. That means that doing something like typing Command-Shift-3 to get a screenshot works identically. In fact, holding down the Command key on the Slim Folio Pro displays the same shortcuts list that you see with the Smart Keyboard Folio. 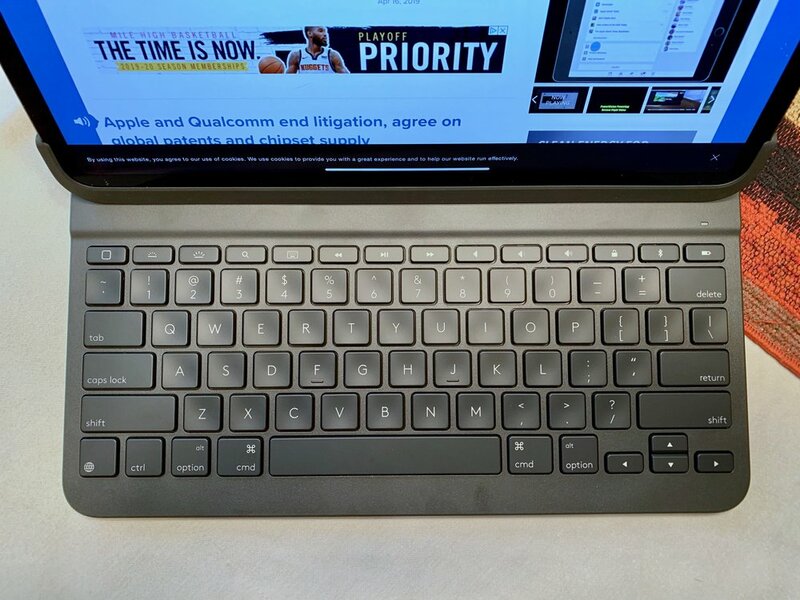 I have to admit that I was dubious about the Slim Folio Pro before testing it, as my previous experience with an earlier Logitech “Create” Backlit Keyboard with Smart Connector left me unimpressed. 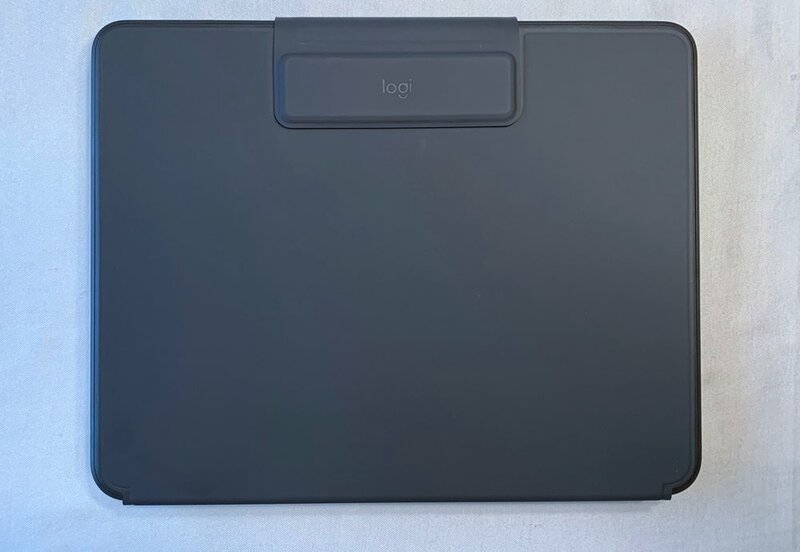 It appears that Logitech decided to go with the tried-and-true Bluetooth design and to resolve most issues with both the Apple Smart Keyboard Folio and Logitech’s previous designs. The result is a very solid and protective keyboard folio for the 2018 iPad Pro models that definitely exceeded my expectations. The fact that it’s $70 less expensive than Apple’s solution for the 12.9-inch iPad Pro is just icing on the cake.